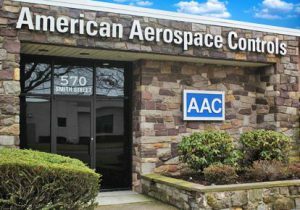 In 1965, Mr. Robert M. Gitlin established American Aerospace Controls (AAC). From the beginning, AAC’s core competency was electrical measurement and control solutions. Early products designed for application specific requirements established a reputation for their high-quality, compact and rugged designs, featuring low power consumption and weight. Experience gained from its earliest projects helped the company develop new technologies and evolved the company’s “Customer Focused” strategy, with emphasis on continuous quality improvement initiatives, as set forth by ISO9001 and AS9100C standards. Today, the company provides AC & DC current, voltage, power and frequency transducers shipping direct from its factory in Farmingdale, New York, USA, to customers worldwide. All products are 100% designed, developed and manufactured in the USA, each tested to rigorous quality standards. When a customized solution is the right one for you, AAC stands ready to provide technical support, applying more than 60 years of experienced, focused and smart thinking to solve your problem — responsively and responsibly. We apply our in-depth know-how and our ISO9001 and AS9100C configuration management processes to all of our projects. We begin with an initial disclosure of system requirements for the potential transducer application. A product concept is then developed which offers a solution with definable advantages over alternative choices. After a series of multidisciplinary discussions with client engineering and project management personnel, AAC products a detailed product development proposal, complete with all necessary data requirements and a program plan to meet or exceed specifications. American Aerospace Controls, Inc. is committed to high ethical standards and social responsibility. This includes supporting the Dodd-Frank Wall Street Reform and Consumer Protection Act as it relates to Conflict Minerals (Section 1502), designed to eliminate support of illegal and unethical actions in the Democratic Republic of Congo (DRC) region. The Conflict Minerals of concern that are commonly used in the electronics industry and referred to as 3TG are: Tin (SN) e.g. solder, finishes on board-level components, Tantalum (Ta) e.g. board-level capacitors, Tungsten (W) e.g. capacitors and RF filters, Gold (Au) e.g. connectors, electronic components. As a custom designer and manufacturer of electronic sensors, AAC does not purchase items classified as “Conflict Metals” directly from any mines or smelters and relies on our supply base of authorized distributors, OCM’s, and other vendors to provide us with information as it pertains to mineral origin. Our suppliers are required to support the disclosure of conflict minerals pursuant to this act and and confirm that all the products they supply to us meet the requirements of the Dodd-Frank Conflict Metals legislation. AAC is not a publicly traded company and therefore not subject to Conflict Minerals Reporting requirements, however we are committed to helping our customers and will support their reporting needs as required with information provided by our suppliers; we can provide Conflict Minerals Reporting Template upon request.